Removing the winter coats of icelandic sheep is not an easy task. 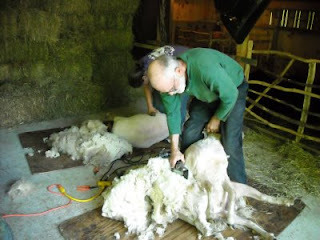 Jim McCrea, an experienced shearer and his assistant took charge of our sheep. Poor Mara had a particularly matted undercoat... after he removed her fleece and handed it to us, he comment "throw a couple of buttons on this and you'll have a coat!" With the heat and humidity here in Vermont, however, these sheep will be happy campers as they head off to summer pasture at HOWL (Huntington Open Women's Land...more to come).